Although I packed yarn to go on holiday to Crete, I didn't expect to pack yarn to come back with from Crete. Then I spotted an ad for a craft shop in Chania, and in the corner of the add, I thought I saw some fibre. So I did what any other fibreholic would do, I tracked down the place and went to see if I was right. Turns out I was, and there were large piles of merino roving right inside the door, alongside some felted hats. Inside, there was more merino roving, some horrible nasty wool fibre for felting and this stuff, in this and four other shades. After finding out the price from the lovely, but slightly confused shopkeeper (who had bought the fibre for felting, and had trouble understanding me trying to explain spinning), I decided that I'd buy 200g from the (large and messy) nest I had in my hands. Once I'd wound off and weighed 200g, there was only a small bundle left, so I weighed that too, and finding that it was around 85g, decided to buy that too. 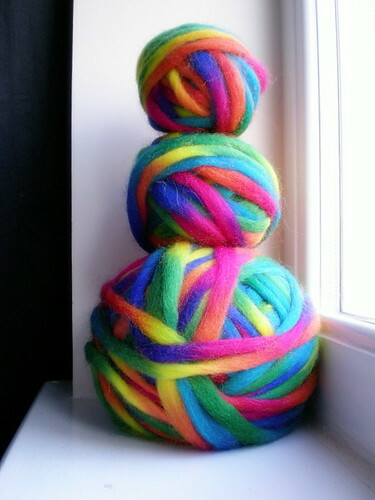 And the entire bundle (approx 300g) of the other colourway I liked (forest greens and browns, very subtle and lovely). At which point the shopkeeper's face fell, and he slightly jokingly (but slightly not jokingly) complained that I was buying his whole stock. Well how was I to know he didn't have more in the stock room? I didn't back down though, that fibre was mine, especially when I realised it was the same range of roving as the stuff my knitty swap partner had sent me, which became the first yarn I've spun this year! I did go back a couple of days later with said yarn, since I'd taken it with me intending to knit it into a scarf, then promptly left the pattern at home in the mad panic to get everything packed. I think he finally understood, but I suspect I'll be remembered as "that crazy British girl who bought all my stock". Worth it though. This stuff is fabulous, and the two small balls shown in the picture above have already been turned into laceweight singles, to eventually become sock yarn.